The battle to lead the Forum for Democracy Change (FDC) Uganda’s main opposition group has been exported to London, with three candidates expected to tussle it out before the party members living in the United Kingdom. The outgoing party president, Maj. Gen. (rtd) Mugisha Muntu, candidates Patrick Amuriat and Moses Byamugisha are expected to present their manifestos to the London FDC delegates. According to a programme seen by PML Daily on Monday afternoon, the debate will take place on October 7, a month to the polls. By October, the five candidates are expected to have covered most of the country, meeting delegates, who will vote them. The FDC set November 18 as the date for elections. Other issues to be discussed at the London meet include the impact of lifting the presidential age limit and the government plan for compulsory land acquisition on Uganda’s democracy and human rights. Other key speakers during the London meet include Dr Kizza Besigye, the former party presidential candidate in last year’s general elections, Dr Vincent Magombe, an African affairs analyst based in London and Prof. Eric Kashambuzi, the Secretary General of the United Democratic Ugandans. 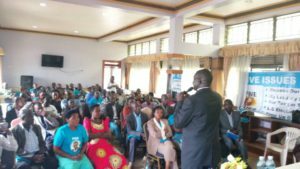 Meanwhile, over the weekend, presidential hopeful Patrick Amuriat Oboi met party members at Grand Holiday Hotel in Mbarara. He told them that when he takes over the presidency, he will make it difficult for government to arrest FDC leaders.